Prog outfit O.R.k. have teamed up with System Of A Down frontman Serj Tankian for their new single Black Blooms. 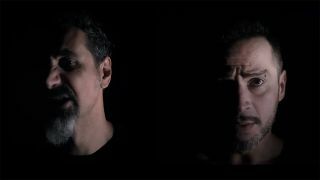 Not only does Tankian split vocal duties with Italian singer Lorenzo Esposito Fornasari (aka Lef), but the SOAD man also appears in the video for the track, which can be watched below. Along with Lef, O.R.k. features King Crimson drummer Pat Mastelotto, former Porcupine Tree bassist Colin Edwin and Marta Sui Tubi guitarist Carmelo Pipitone. Black Blooms will feature on O.R.k.’s upcoming album Ramagehead, which will launch on February 22 through Kscope. Edwin says the collaboration between the band and Tankian came about thanks to producer Bill Laswell, who played played bass on Lef's 2018 solo album Hypersomniac. Laswell passed a copy of the record on to Tankian who was so impressed, he then checked out O.R.k’s other material. Edwin adds: “This led directly to Lef and Serj connecting and discussing potentially collaborating at some point – it was just at the time we were working on Ramagehead, so of course a suggestion had to be made. Edwin reports that the development of the song “took a few unexpected” twists along the way, adding: “Pat’s masterful drumming added an underlying aspect of urgency I hadn't anticipated on the original demo – and Carmelo manages to strike a superlative balance between sensitivity and total fireworks as the song progresses. “The atmosphere was always going to be a great context for Lef's vocals, but the biggest surprise was Serj’s involvement, which really amazed me when I first heard it. "He’s added, not simply a great vocal performance, but the exact amount of extra depth to the framework, to turn it into something truly special. Ramagehead was recorded in Italy, the US and the UK and features cover art from Tool's Adam Jones. It’s now available for pre-order, while O.R.k. will head out on tour later this month.